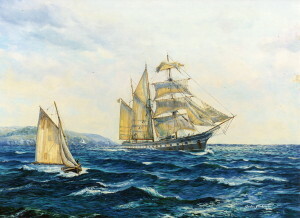 On-board Cutty Sark, exhibited at the request of her then Captain, Simon Waite. Simon, [an ex B I master mariner] was quick to read the sea pattern, saying I’d got the waves just right for the currents around Falmouth. By Gordon Frickers measures 76 x 101 cm (30″ x 40″), oils, original displayed on board Cutty Sark, subsequently sold to a descendant of Vasco da Gamma. The old Portuguese ship “Ferreira” departing Falmouth, her last departure with a ignominious cargo, scrap iron. It looked like the last chapter in a story that at one time had been glorious, her time was almost ‘up’; it was not. Two years later, and as a direct result of the accident that took her off her course, in distress into Falmouth for self repairs, under tow she returned to Falmouth Docks to be reborn, to become again, a bright star on all our lives. Today millions of us know that elegant but shabby old ship “Ferreira” by her original name, “Cutty Sark“. There is a lesson and inspiration in there for us all is there not? The former “Cutty Sark” is shown here making her last departure from a port as a commercial ship. 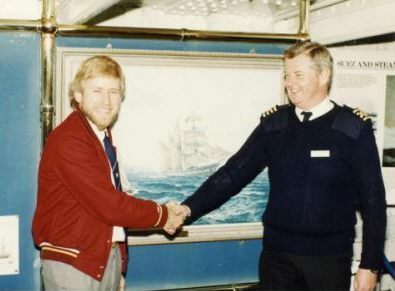 The artist Gordon Frickers has a long association with “Cutty Sark“. 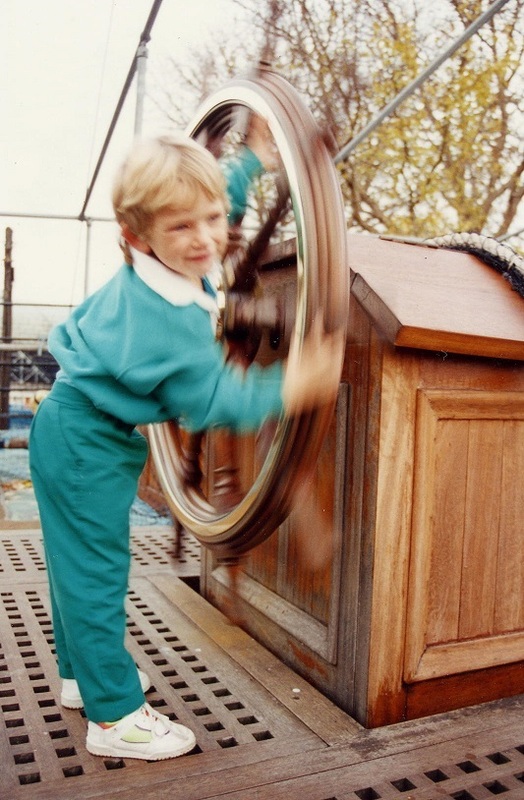 He last visited Cutty Sark with his own children. New Helmsman for Cutty Sark? [my son, Graham Frickers]. “Ferreira” ex “Cutty Sark“, a limited number of ‘Heritage’ quality copies on canvas are available as a signed by the artist Gordon Frickers, priced from £157.00, don’t hesitate to ask for details. I also made a painting of “Ferriera’s” “Last Arrival“ towed to Falmouth for restoration by the tug ‘Triton‘. Further Reading: plus > Useful facts + excellent stories about [CF7_get_post_var key='title'].